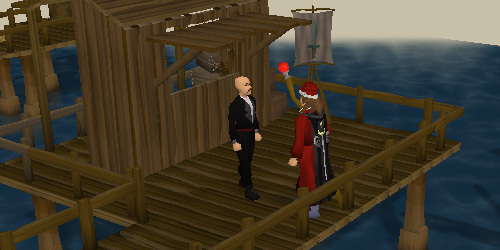 This small port is located a short distance south of the bustling city of Ardougne. 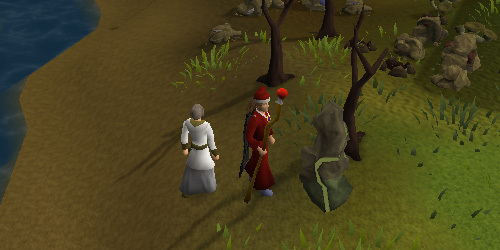 It's generally a quiet place in RuneScape, as you'll seldom find many people here. But there are still a few things to do while at Port Khazard! This town is usually visited for its legendary Activity, although there are some other places to check out as well. At the northern end of the port is a small mine. 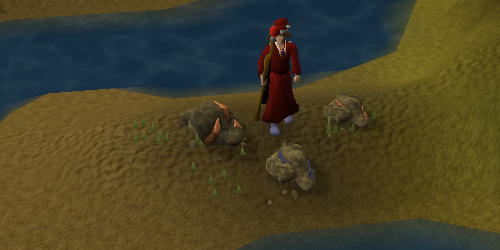 You'll find two Tin rocks and one Mithril rock here, as well as two rocks that do not contain any ore. In the center of the port are the anvils. There are 3 of them for you to smith your bars on, although they aren't of much use since there is no nearby bank. 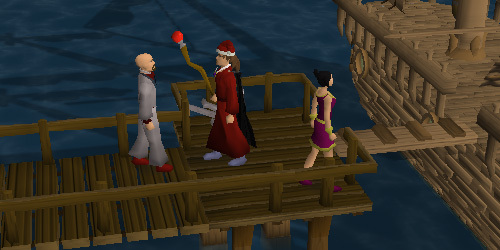 Port Khazard is home of one of RuneScape's most fun Activities: the Fishing Trawler! Get friends, or people that you don't even know to play this fun sea game! Make sure to bring some money for supplies though. To start the game, speak to Murphy and agree to go on a fishing trip. You'll probably want plenty of Swamp Paste, Rope and a Bailing Bucket, as the ship is a bit unsafe. Then just board the nearby boat to begin the game. 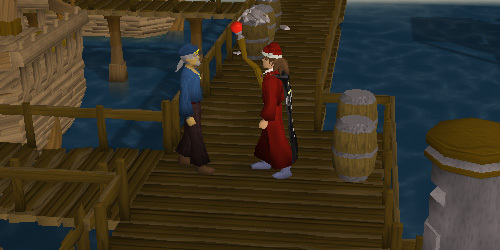 Be sure to check out the Fishing Trawler Activity Guide for more info! 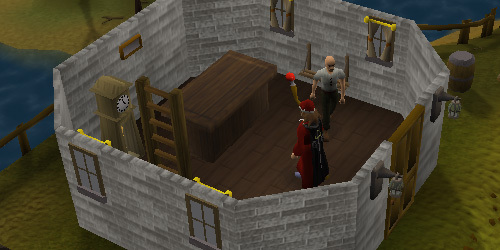 A Bank Deposit Box can be found near the dock, which you can use to deposit items directly into your bank. 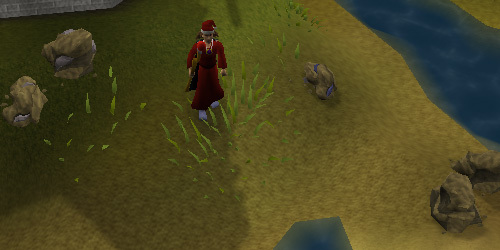 This is particularly useful for quickly depositing catches from the Fishing Trawler Activity if you're planning on playing multiple games, as well as for players using the nearby mines. 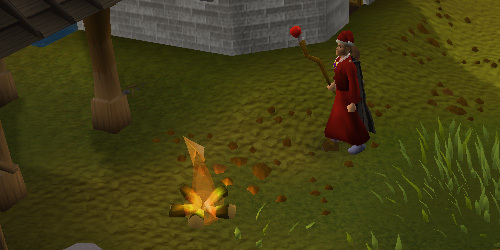 Just south of the Bank Deposit Box is an everlasting fire, which can be used as a normal fire to cook food. On the southern dock you will find two Trader Crewmembers who will offer you passage on their Charter Ship. 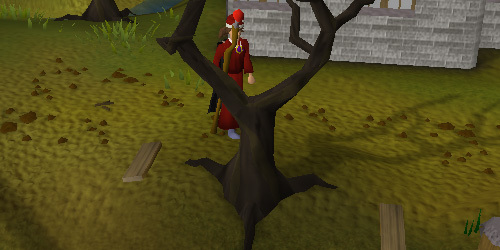 Possible destinations which you can travel to include Brimhaven, Catherby, Karamja, Port Phasmatys, Port Sarim, and Port Tyras. Tindel Marchant is found on the southern docks of Port Khazard. He runs an ancient sword shop. 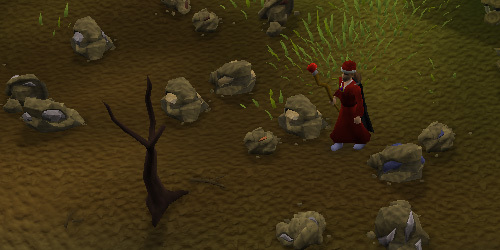 Here you can trade in your Rusty Swords for 100gp. He will polish it up and it could turn out to be anything from a regular Bronze sword to a Rune Sword. 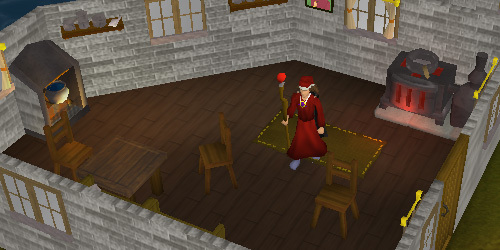 It could even be an Antique Sword, which he will offer about 2,000gp to buy from you. So the next time you find a Rusty Sword, don't drop it! Instead, bring it here. There are two General Stores here in Port Khazard, both selling the same supplies. In the southern part of the city are two Plank respawns. A short distance southwest of the Anvil building is a small mine containing one Mithril rock and two Copper rocks. At the west entrance to the port are two buildings, each with a Range for cooking. Again, these aren't particularly useful, as there isn't a nearby bank. 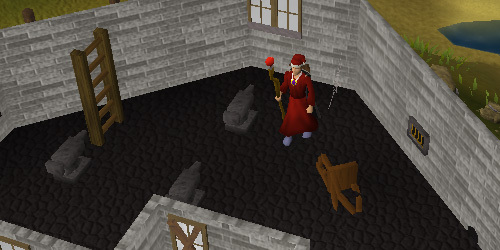 Just west of the main port area is a Small Obelisk, used to recharge your Summoning Points. 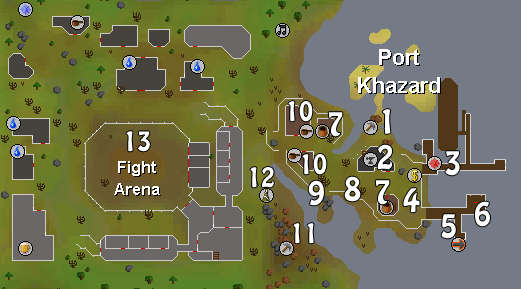 To the west is the Fight Arena, used in the Fight Arena Quest. You'll be fighting monsters inside to rescue Lady Servil's family from the Khazard General. To start the quest, talk to Lady Servil found in the northwest corner of the Fight Arena area. Murphy is in charge of the Fishing Trawler and will allow you to board his ship and take part in this exciting Activity. The two Shopkeepers run the General Stores in Port Khazard. Tindel will take your Rusty Swords and polish them for you. To board the charter Ship to sail to another port, speak to a Trader Crewmember.